We visited an area that has been hit by a flood in Bekasi, Jakarta, February 2014. 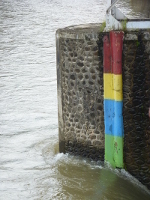 Katulampa, Bogor, is located upstream from Jakarta, on the river Ciliwung, the most important river flowing through the city. 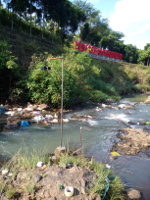 The site has measurement points to monitor the level of water with gauges, cameras, and water level indicators. There are 4 warning levels, represented by 4 colors: green, blue, yellow and red. 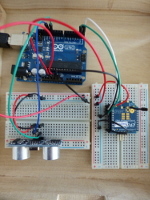 In cooperation with IRD, BPPT, DRR Foundation and Diponegoro University, 3 students from Diponegoro University are working on a prototype of flood monitoring sensor module for Jakarta. The image visualizes the inundated area computed using GRASS , an open source GIS. Roassal and OpenStreetMap are used to visualize the results of the computation. With Cirela's french partners LABSTICC Université de Bretagne Occidentale and IRD/UMPC, indonesian partners BPPT and DRR Foundation, and vietnamese partners Can Tho University, Cirela begin working in 2016 on a STIC ASIE (ICT ASIA) project on environmental modelling. The group of partners working in this project is named SAMES (STIC Asie Modeling for Environment and Simulation). Cirela, BPPT and DRR Foundation, organized a workshop on the technology Internet of Thing and Wireless Sensor Networks for flood monitoring in Jakarta, with the participation of BPBD (Regional Agency of Disaster Management) Jakarta, Diponegoro University and World Bank Jakarta. 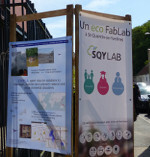 Joining the stand of SQYLAB, an eco fablab of Saint-Quentin en Yvelines, France, Cirela participated to the Alternatiba SQY days, in La Verrière France. Presentation of modeling and flood monitoring (jakarta case) on the workshop on Modelling and Environment, in Brest, December 2015. On the subject of disaster preparation, Cirela presented a talk on Disaster Preparedness: Technological Challenges on the RESSACS 2016, in Bondy, May 2016. A paper of Cirela and its ICT Asia partners, entitled 'Wireless Sensor Network based Monitoring, Cellular Modeling and Simulations for Environment', has been accepted and presented in the ICT-Bio Asia Workshop 2016, in Kuala Lumpur, May 2016. Cirela participated to the D4D Datathon 2015 in the Resilience team with IRD, University of Chili, ENSCI students, and won a honor price from the jury.